The final act of the season is upon the men’s and women’s tennis teams. Returning from their California road trip, where both the men and women went 2-2 against non-conference competition, both teams have settled back into the NWC grind. Both squads won all of their weekend matches last week, giving the men a 5-2 conference record (ranked 39th by the Intercollegiate Tennis Association), while the women remain undefeated at 9-0 (ranked 20th by the ITA). The Pioneers hope to close out the season with vigor, gaining momentum as they enter the NWC playoffs. The California road trip from March 21-26 did much to bolster the teams for the rest of the NWC competition. Both squads faced some of the most competitive teams in Southern California, as the men beat Colby College (5-4) and Chapman University (5-4), while the women defeated Chapman (8-1) and La Verne College (9-0). Following their spring break trip, both squads set about solidifying their climb up the NWC. One of the most significant of these games was on April 2, with the men’s team win against Whitman College. With their 5-4 victory, the Pios became the first NWC team to defeat #14 ranked Whitman in nine years. This was a tough matchup, with both singles and doubles teams winning tight duels. Gordon Barrows ’18 and Brenden Barrows ’18 defeated the #14 doubles pair in the country (Zach Hewlin and Phillip Locklear) by an 8-6 score, while Kevin Ross ’16 and Harrison Collins ’18 beat Adam Rapoport and Gary Ho by an 8-3 score. Ross also contributed one of the most arduous singles victories against Petar Jivkov, rallying in his last two sets to beat him by a score of 5-7, 7-6, 7-6. Daniel Hahm ’16 (the NWC Men’s Tennis Athlete of the Week for April 4), the team’s other senior, blasted through Robert Carter with a score of 6-7, 6-4, 6-4. “Our men have believed all along that they could play with some of the best in the country. Whitman’s run in our conference has been amazing, but our guys didn’t let that deter them from coming out and playing their game,” said Assistant Coach Jimmy Chau, in an interview with LCPioneers.com. The women’s squad has maintained the same tenacity that drove them to their undefeated NWC record. They showed great resolve against #25 ranked Whitman College, exemplified by the doubles team of Christine Eliazo and Claudia Lew (14th ranked) rallying from being to down 7-2 to defeat Allie Wallin and Lindsey Brodeck by a 9-7 score. This performance, along with her 6-3, 6-2 win against Cello Lockwood, netted Eliazo her second consecutive NWC Athlete of the Week. 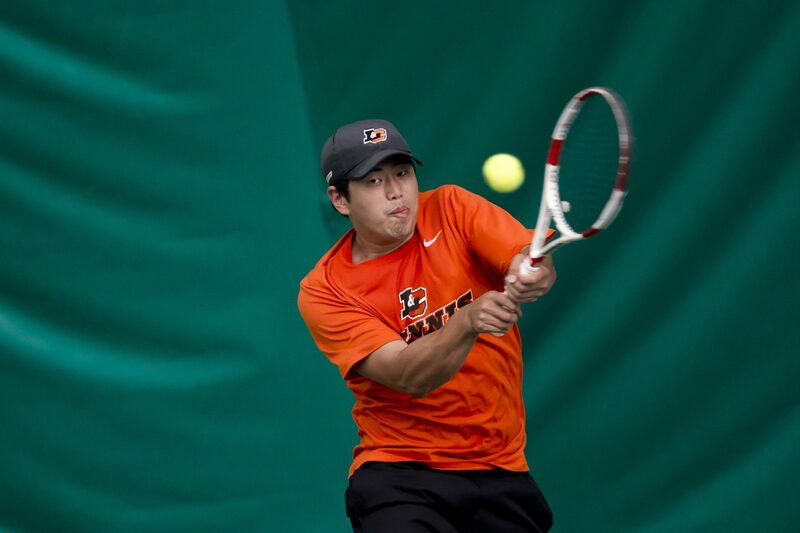 Eliazo was among three Pios to win their singles matches in straight sets, alongside Summer Garrison ’18 and Wiktoria Plawska ’17. 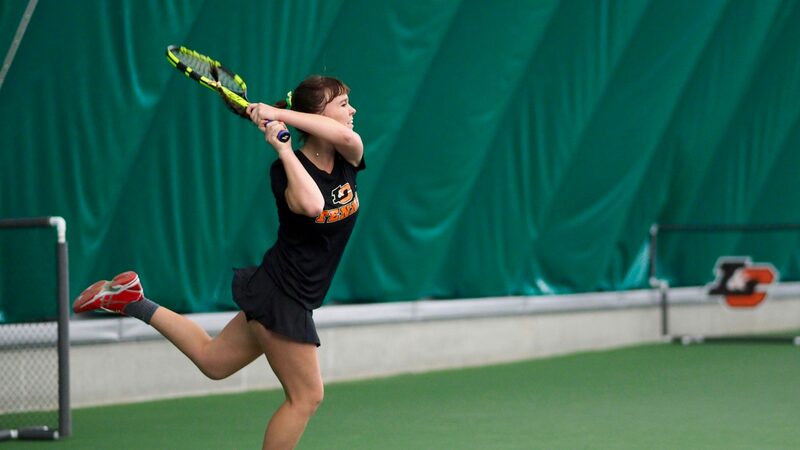 The Pios won the match against Whitman by a score of 5-4, sweeping Whitman in the regular season. “Luckily, our All-American pair of Christine and Claudia found a way to salvage a doubles point by winning seven straight games. With one in our back pocket, our women went to work and found the fire they have been playing with this year,” said Head Coach Patrick Dreves, in an interview with LCPioneers.com. Both the men’s and women’s tennis squads have exceeded expectations for the season, and now they look to take on the playoffs. Both teams have different paths to the playoffs, each with their own challenges. With their two-game lead on first place, the women’s squad will play three home games against University of Puget Sound, Pacific Lutheran University and Linfield. The men have five games lined up for them, all on the road. They play George Fox University, Puget Sound, Pacific Lutheran, Linfield College and Willamette University. They are currently in third place, granting them the third seed for the four-team NWC playoffs. While the women’s team will look to hold onto first place, the men will seek to cement their status in the playoff field. The men’s squad will serve up their match on Friday, April 8, against George Fox, while the women will take to the court again on Saturday, April 9, against Puget Sound. Enter your email address to subscribe to The Pioneer Log and receive notifications of new posts by email.